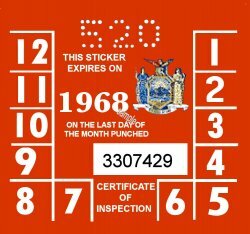 1968 New York INSPECTION Sticker - $20.00 : Bob Hoyts Classic Inspection Stickers, Add a Final Touch to your Restoration! This beautiful 1968 New York sticker has been painstkingly reproduced both front and back, directly from an original. This sticker was placed on the upper center of the windshield just to the driversw side of the rear view mirror. This location was discontinued in 1969 because of the tinted windshields.